I bought these eyeshadows as an experiment. 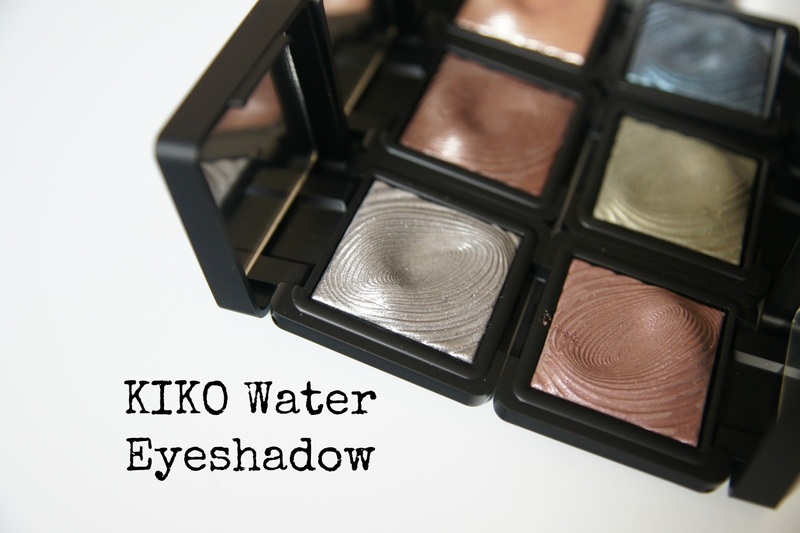 In June I visited KIKO for the first time and these were the things that seemed the most impressive from the range of products I swatched all over my chubby little hands. And because I thought they were pretty in the pan. At the time, NARS were about to launch their Dual Intensity eyeshadows (reviewed here) and I felt these may be a good 'cheaper' alternative. 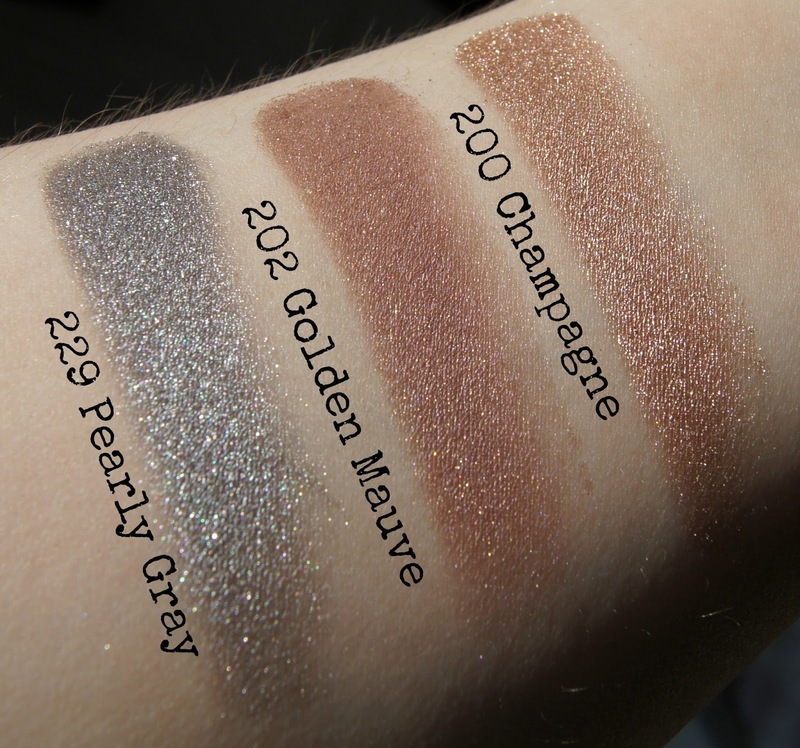 For price comparison purposes the NARS eyeshadows retail at £21 and these shadows from KIKO retail at £8.90. You also get 3g of product with KIKO compared to 1.5g with NARS. The colours swatched beautifully in the store, super pigmented and buttery and under the bright store lights I was suckered in. The shadows apply really easily and evenly dry and most are relatively easy to blend out when dry. Wet they become more metallic but really difficult to blend so are best used wet either packed on to the lid or as a liner. 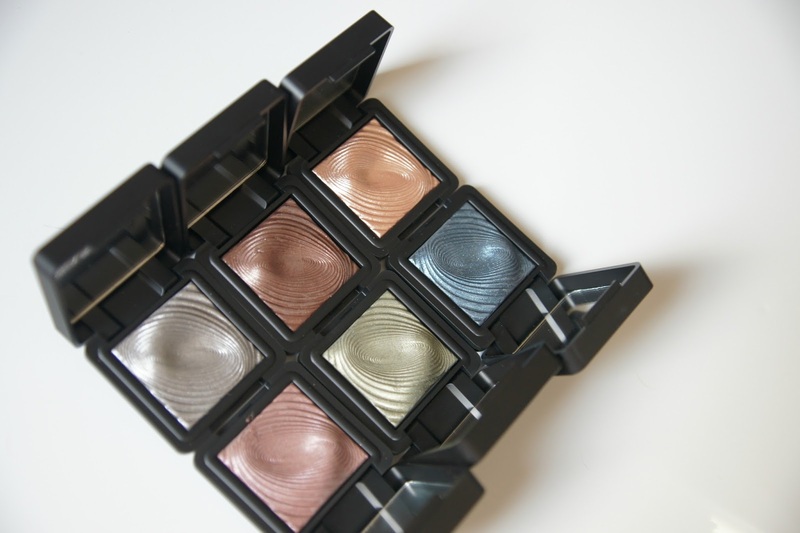 The shadows have the same highly reflective almost metallic texture as the NARS dual intensity shadows. They last all day on the lid without fading or creasing. Every time I try and open the eyeshadow I chip my nail polish! It's packaged similar to the NARS but without the magnetic closure making it quite difficult to yank open. There is however a little mirror in each compact which is useful. But beware, the actual pan is really fragile and two of them were broken when I got them home, luckily I noticed whilst in London and they exchanged them for me. There is a ton of fallout with these shadows when applying them to the lid. That's not the biggest problem though-the biggest problem is that the shadow in the pan isn't necessarily what you get on the lid. And then when you try to blend the darker colours together you completely lose the pigmentation of the shadow you are trying to blend on top and the shadow just seems to disappear into the shadow underneath. That's the kicker for me-because some of the shadows in the pan don't translate well onto the lid I have found them to be unwearable for everyday use. The two neutral shades that could be nice for daytime are absolutely packed with glitter and fallout. Midnight blue is pretty consistent from the pan to the lid but looks like a 70's disco ball on my lid. Even Mike was like 'woah where are you wearing that too?' It packs onto the lid fine but is a bugger to blend out. There's no chunky glitter in this shade but tons of micro glitter shimmer. A lot of fallout with this shade. Olive green is really beautiful in the pan (very similar to MAC Sumptuous Olive which I love) and on the lid looks more emerald with a yellow undertone. The formula of this shade is much nicer to apply though, it's very smooth and blends well and has no obvious glitter in it. Pearly Coffee is a glittery dark brown, it almost looks muddy in the pan. It's packed with silver glitter and there is a fair bit of fallout making it just a bit full on for daytime wear. It's really difficult to work with and blend out-it really does take some work. It also has a tendency to lose its brown shade when blended on top of other shadows-often looking black or purple. Champagne looks like a warm light bronze in the pan but translates to a lighter shimmering champagne tone on the lid (very similar to Stila Kitten in tone). There is a lot of glitter in this shade as well and a fair amount of fallout. Golden Mauve is another really odd shade. 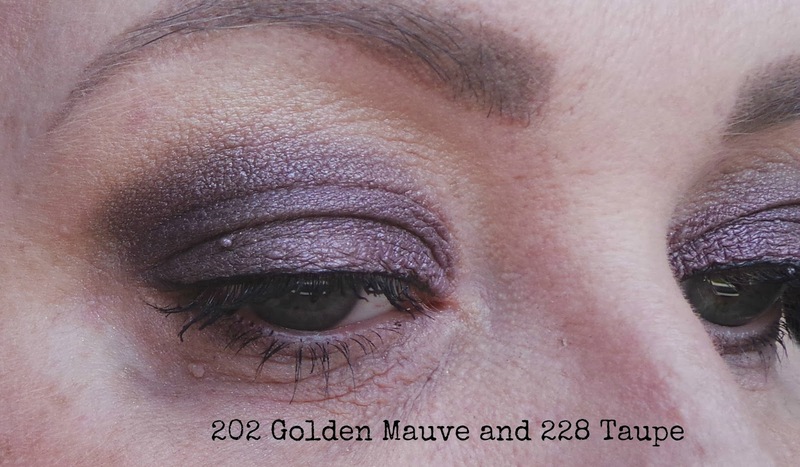 I would describe the shade exactly as the name-a golden toned mauve in the pan. Almost a little bit rose gold. But on the lid it's purple. Definitely purple. It completely loses the rosyness in the shade and barely looks differentiated from Taupe. Pearly Gray is a steel silver with a lot of glitter and a foil like finish. All the looks below are done with the eyeshadows used dry straight from the pan over a clear primer and photographed in natural light. So are these a good dupe for the NARS Dual Intensity eyeshadows? Yes and no. 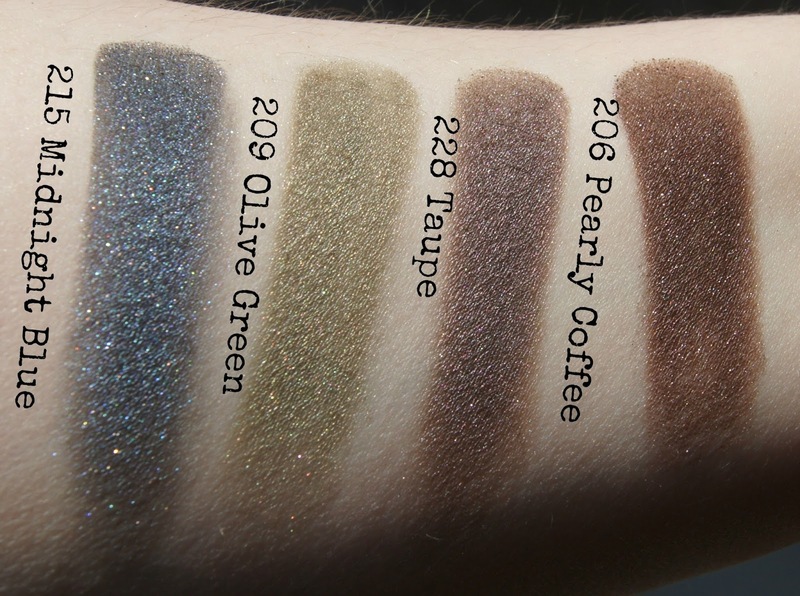 They're not bad eyeshadows, they're priced really well and if you can work with them and accept the colour differentiation they look nice on the eyes. They're going to give you a similar effect the NARS shadows do-that highly reflective, luminous look but the NARS shadows knock the socks off these in terms of the quality, ease of application and the overall finish.